I would be much appreciated. These are seperated questions. Hope you can help. and VidoTrim-Fragment must be VideoTrim-Activity. these are the activities. like you see on the image. If I understand everything correctly I think I have a solution. I will ignore all other aspects of the navigation and just focus on the fact you want to go from VideoPreviewActivity to the MainActivity and adjust the fragment stack, and that this is being triggered from a done button (or something similar) but NOT the back button. The simple way would be to use the activity result functions startActivityForResult which would allow you to use a onActivityResult function in the main activity to pass the information back. 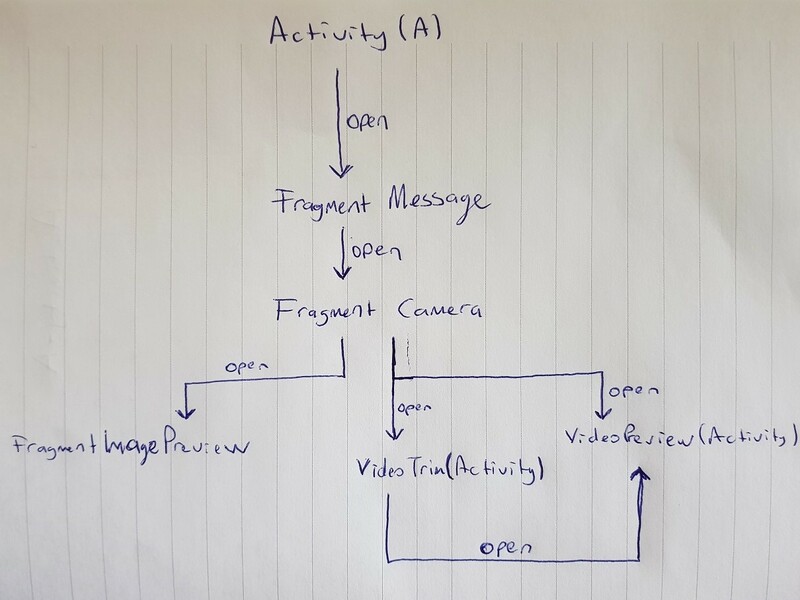 However you may potentially navigate to the VideoPreviewActivity via the VideoTrimActivity so you would have to pass this information back through two activities which would be a bit messy. So my proposed solution has a few steps. Instead of starting a new MainActivity this will return you to the previous one and finish all the activities sat above it in the task task. Add this function to the MainActivity. Then in the onStart function you can check your intent to see if there is data in there returned from VideoPreview and remove the fragments you no longer need. Where "MESSAGE_TAG" is the tag used in the ft.addToBackStack("MESSAGE_TAG") call.